Scott Mann, host of Permaculture Podcast. And author Leslie Crawford, with Alice. Leslie Crawford, author of Sprig the Rescue Pig and Gwen the Rescue Hen, had a chance to chat recently with Scott Mann, host of the popular Permaculture Podcast. In an episode that has been “downloaded thousands of times,” according to Mann, the two talked about agriculture, food activism, and why it’s important to try to get into the mind of a pig. Here are a few [slightly edited] outtakes from the conversation. You can listen to the entire episode here. Sprig sets out on a pig-centered adventure that leads him to his new best friend, a girl named Rory. Inspired by true events, this light-hearted tale introduces kids to an intelligent and inquisitive pig, one not all that different from most other pigs, who finds his way to a good life. On sale now. Scott Mann: Leslie, can you tell us a little bit about yourself and how you went from being a journalist to writing Sprig the Rescue Pig? Leslie: I've been a journalist for well over 20 years and this sort of came as one of those gifts at the perfect time. I was leaving a full time job and Clare Ellis, a friend who had just started Stone Pier Press, an environmental publishing house with a focus on food and sustainability, told me she wanted to do a series of children's books about industrial farm animals. The idea was to suggest the possibility of a different kind of life for these animals and, beyond that, to introduce readers to the many wonderful qualities these animals possess. Clare asked if I would try writing about a pig and I was like, “Okaaay, why not, I'll try it!” And so I sat down and tried to get into the mind of a pig who has just left a factory farm. Scott: Do you have a background in food policy and activism that led you in this direction? Leslie: I have a background in food activism. I helped start a farmer's market in my neighborhood that was based on a neighborhood protest. An out-of-state corporation shut down an organic food store where the workers were about to unionize. I have followed Sprig into animal activism and become really passionate about it because of what I've learned in the process of researching industrially farmed animals. Scott: One of the things that stood out for me about your book is its positive approach to animals and food. The relationship that children or people have with farm animals is usually about food but you’re suggesting it can be something else. Yet the book doesn’t push an agenda. Rather it creates a space where we can connect with industrialized farming, and then make a different decision about whether we want to support it or not. The book you've written creates a more open environment that allows for having these kinds of conversations. Leslie: I think the best way to win hearts and minds, whether it's about how much meat we eat and where we get our meat, or just how we treat other people or think of animals, is from a place of empathy and understanding. Once you stop seeing a pig, or a person, as the “other” you suddenly really see them. So maybe you stop thinking of a pig as just bacon. Maybe you start thinking of a pig as an animal, like Sprig, who has talents and even superpowers, like his ability to smell things from so far away. Scott: Could you share some more with me about pigs and what makes them so interesting and unique as animals in the world, and how that created this joyful little character Sprig? Leslie: What I hadn't really known about pigs are their remarkable cognitive abilities. They are right up there with dolphins and chimpanzees and smart dogs. Certainly they can do many of the same things that dogs can do: come when called, recognize their name, perform tricks, build bonds with people, empathize. Some scientists somewhere had pigs play video games just to see if they can, and they could. Pigs are also quite curious creatures, another sign of great intelligence, and affectionate. Scott: The way you normalize the relationship between Rory and Sprig was another thing that I took away from the book that reinforces this positive approach, this loving approach, to animals and our relationships with them, and the way that we might interact with their world. Rory sees one of her friends and it's like, "Hey I've got a pig," and they're like, "That's cool." You know, like it's totally normal to have a pig on a leash. In the same way I think your book shows the power that children can have to really influence and change what we're all doing based on what they're interested in. With this work of Stone Pier Press and what you've done with Sprig, are you going to be working on more stories that create connections and relationships between humans and animals? Ones that suggest the importance of treating animals more fairly and humanely? Leslie: Yes! Thank you for asking. I just finished my second book, Gwen the Rescue Hen, which is coming out this fall. 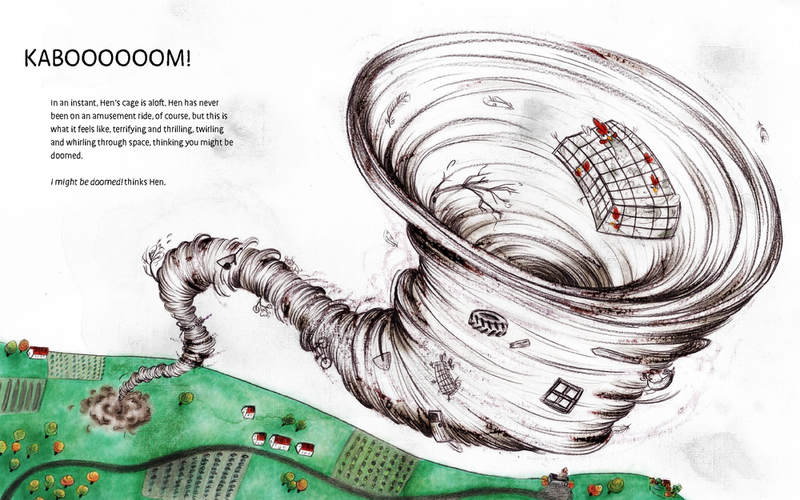 The story, which is loosely based on fact just as Sprig was, starts on an industrial egg-laying farm that’s torn apart by a tornado. Gwen is spun around in a kind of Wizard of Oz style. And she actually lands on top of a diner called "Ma's Chicken Lickin' Diner." So, it's kind of like, "Oh, this is where chickens end up." But then she meets a little boy named Mateo who takes her to a very different place, and together they learn about how wonderful it is to be a chicken. Gwen the Rescue Hen, the second in Stone Pier Press's Farm Animal Book series, is about a chicken who is sprung from her coop by a tornado and discovers a whole new way to be a chicken, including learning how to ride a bike. Available for pre-order.